A place that is hot, dry, dusty, in which justice was served at the end of a pistol and in which the frontier ethos still exists to this day. All present-day Arizona became a part of the Mexican State of Vieja California on the Mexican assertion of independence from Spain in 1822. The United States took possession of most of Arizona at the conclusion of this Mexican-American War in 1848. Arizona was admitted into the Union — formally becoming a U.S. country — on February 14, 1912, that is why we’re sometimes given the nickname the ‘Valentine State’. Wildlife can best be considered by lounging riding or walking along the river, or even drifting downstream at a kayak or inner tube. The bald eagle, osprey, peregrine falcon, Harris’s hawk, heron, egret, waterfowl, and other riparian and upland birds are often seen.Lots of species of migratory songbirds also appear during the spring to nest in the region, such as black-chinned along with Costa’s hummingbirds, vermilion and ash-throated flycatchers, Bell’s vireo, Lucy’s warbler, and hooded oriole.Mistletoe clumps in the mesquite and cottonwood trees attract an assortment of wintering birds that feed on the abundant antioxidants, such as phainopepla, northern mockingbird, western bluebird, American robin, and cedar waxwing. Bighorn sheep, deer, javelina, coyotes, fox, bobcats, raccoons, skunks, and other creatures may be seen on the hillsides or visiting water, based on the time of day. River otters are occasionally seen along the riverbank or swimming in the water. Of the various lizards, snakes, and toads found in the area, the gopher snake, coachwhip, western diamond-backed rattlesnake, desert spiny and zebra-tailed lizards, and Woodhouse’s toad are most frequent. Among the most overlooked fishing adventures within this area is trout fishing the Salt River below Saguaro Lake. Rainbow Trout, Largemouth Bass, Sunfish, and Catfish can all be seen from the waters of the Salt River below Saguaro Lake. Take advantage of this year-round trout fishery in the summer once the air temperatures have been 100°F along with that the water is 65°F. You may learn more about fishing in this region at the AZ Game & Fish Department. Riverbound Sports can supply all the equipment you need to get on the water starting at $40 a day. Check out our pricing and options for Paddleboard Rentals in Arizona. If you are looking for a real adventure: paddle boarding on the Salt River is the way to go. Believe it or not, one of the best ways to explore The salt River. There is nothing like stroking down this lovely desert river fringed by cactus, and wild horses grazing at water’s edge. 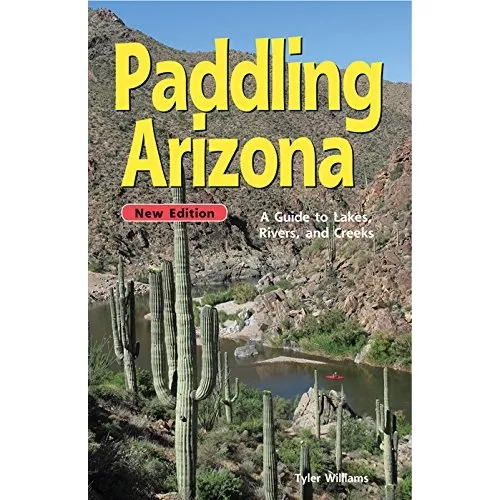 This can become your zen moment, paddling down the Salt River below Saguaro Lake, standing on the water and smiling. Find a new way to experience Arizona with SUP Paddleboarding.